I love Finnmarken, her design and looks. Not to mention her.... wait for it...you know what thingy it is....her ROUNDED STERN!!!!!!!!!! Oh, and a great big WELCOME to you, Helleholm. We are GLAD to have you aboard with us. We have a lot of fun here!!!! We discussed Finnmarken quite a much onboard NN. Everybody seems to like her, even HaraldJarl was a bit fond of that ship. When it was announced that it was going down below I thought what a pity, I really want to sail on it someday. Maybe the next CVF cruise will be on FInnmarken? I actually think that the crowd is heading to Nordstjernen. Last edited by Skipskatta; November 10th, 2011, 22:03. That is certainly Finnmarken, no doubt! 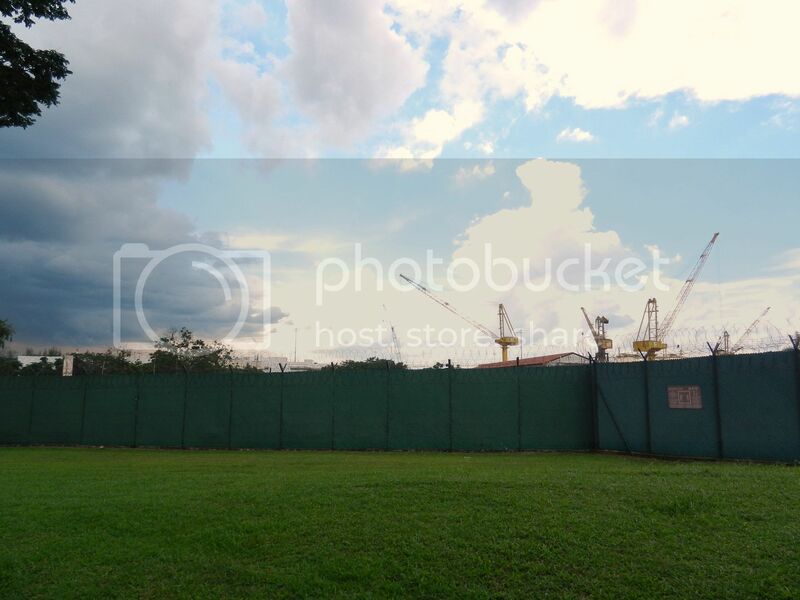 I went looking for Finnmarken at Sembawang Shipyard today but, as I had no good excuse for entring the yard, I could only look from outside the fence. No, no sign of her here, unless hidden behind one of the big ships. Someone with more detailed knowledge of the vessel may confirm that? A bit further on I spotted a white funnel with a red "dot" and a H, so no doubt it was her. Unfortunately I didn't get a picture as I expected to get a better view from a position closer to the gate. Not the vessel seen in this GE capture obviously, but in that position. 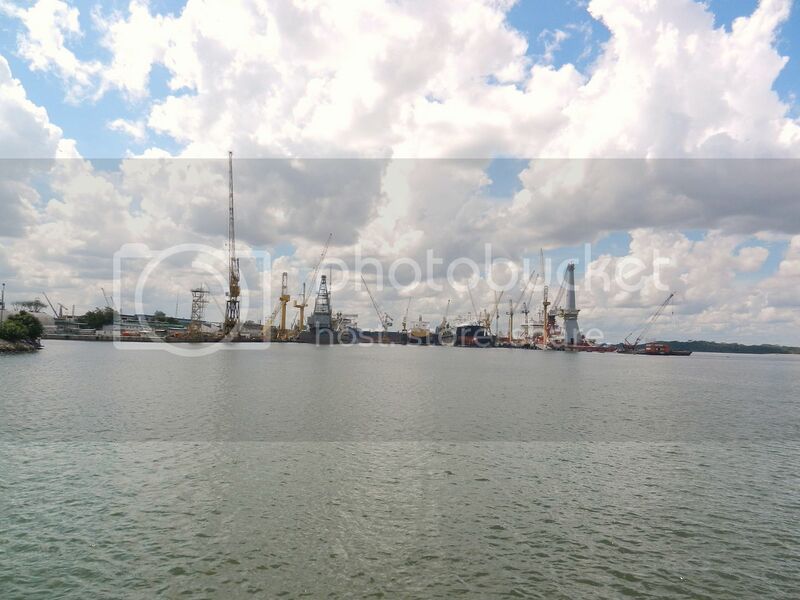 A large LNG Carrier in the other Graving dock would have blocked any possible view from the opposite side. In any case, a taxi popped up just in time to avoid being caught in the rain. Having spent almost 1.5 years in Australia, and mostly idle, it will take some time to get her back in shape. With 10 year special survey as well I think she is going to be there for quite some time. Anybody know what is her ETD S'pore??? Who knows, I may get a change to pay a visit to the yard, or may even be invited on board as the official CVF reporter. Last edited by ombugge; November 13th, 2011, 13:25. Thank you so very much, I was actually quite a bit exited about these photos, even though we do not see much of the ship. This is historically the first image EVER (that I see) of a Hurtigruten vessel in tropical Singapore! 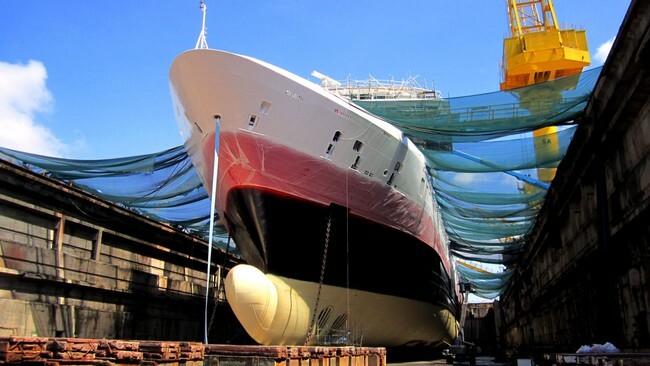 I can't explain why it's so exciting that there's a ship in a Singaporean shipyard that's changing colour and getting ready to come home to Norway - but it really is!! She's already starting to look beautiful again. So exiting to see her again, and to hear from her like this. I see from the article she'll be making the long way home via Cape Town.... do we have any members down there? The trip will start in the beginning of December, so maybe some time next week then.... a long way home for our dear lady! Finnmarken has moved out of the Drydock. Now moored alongside the wharf at Sembawang Shipyard. Has she started her long voyage? 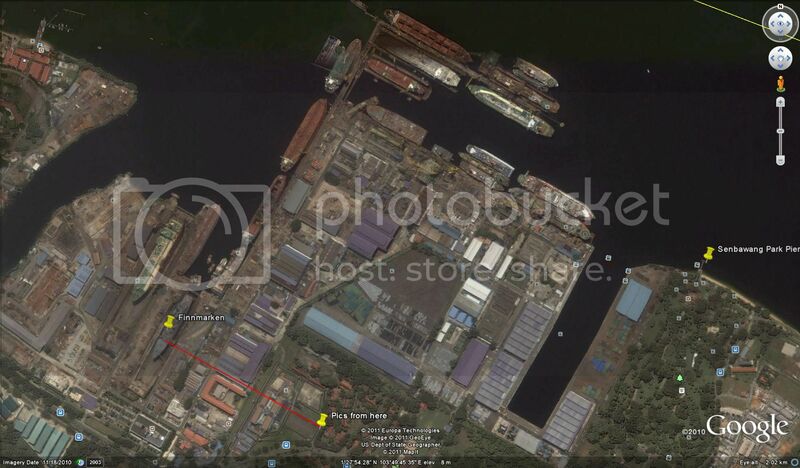 Has anybody got any info re: ETD for Finnmarken from Sembawang Shipyard and Singapore???? Last edited by ombugge; December 10th, 2011, 17:54. Finnmarken has turned on her AIS. 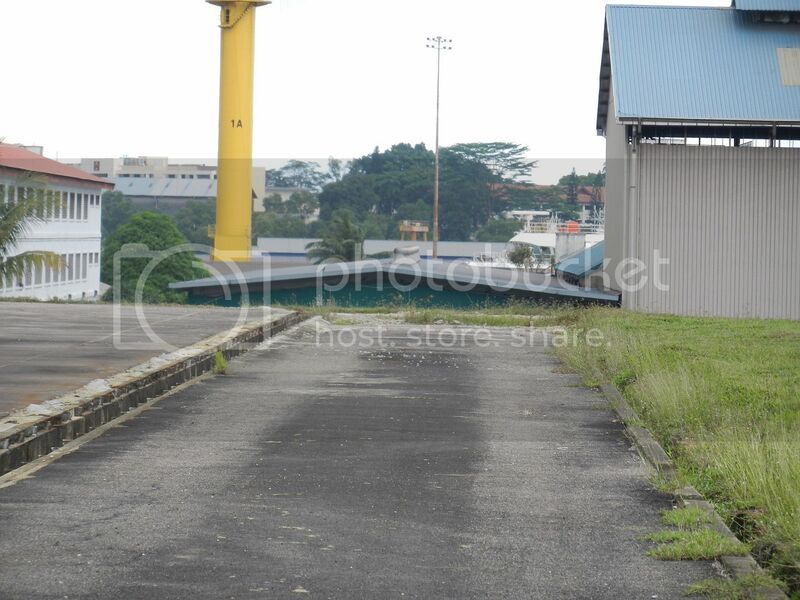 She is still in the same place at Sembawang Shipyard though. If my memory serves me correctly, I read somewhere that the voyage home would take an estimated 42 days of sailing, excluding the bunkering in Cape Town, SA. I also recall that she was due to leave Singapore during the first week of December, which means she is falling a bit behind schedule, and that departure might be any time now.